It is that time of year again where many award organisations are taking votes for various industries gearing up for the 2016 award ceremonies and it is a very exciting time indeed. From the wedding industry and other corporate industries to educational award ceremonies, if you have been tasked with planning one, you might want to consider hiring entertainment to help keep everyone occupied and prevent boredom! As glamourous as award ceremonies can seem, most of the time guests are seated around tables which can get quite tiresome. Keep reading for our fantastic entertainment choices for award ceremonies from our website, www.EntertainersWorldwide.com! Hire a Close-Up Magician to Work their magic around the tables! Our most popular choice for award ceremony entertainment has to be the Close-Up Magician. These talented entertainers are very unobtrusive, so they can perform while your award ceremony takes place. 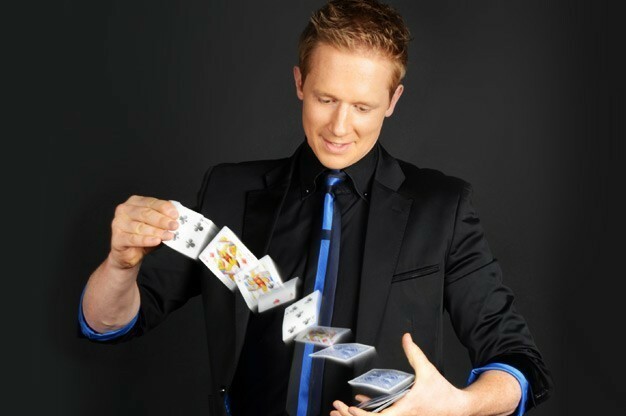 Working from table to table, a Close-Up Magician will perform sleight-of-hand and illusions featuring a number of small objects, such as playing cards, coins and bank notes. Your guests will be amazed as they are involved in illusions and this type of entertainment will leave them wanting more. Give your guests something to talk about at this years’ award ceremony and hire a Close-Up Magician! Another unobtrusive form of entertainment is to hire a lookalike who will mingle with guests during your evening. They not only look like their idol, but try to act like them too so your guests will be questioning whether the real celebrity has turned up at your award ceremony! 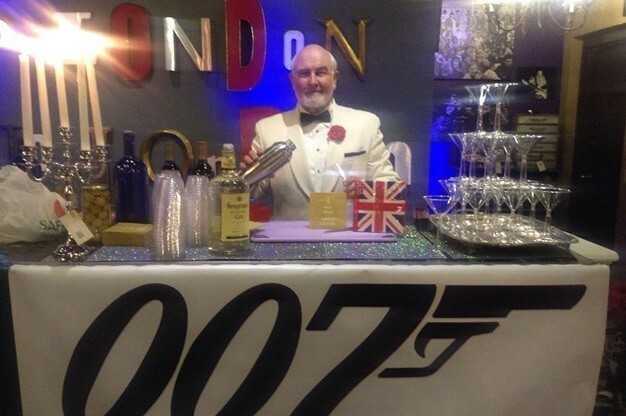 We have plenty of lookalikes to choose from, including Daniel Craig, Sean Connery and Gordon Ramsey. Lookalikes can add a fun and dynamic element to your event so if you want to surprise your guests, click here and browse our selection of Lookalikes on our entertainment directory. Every award ceremony can benefit from background music, but the key is not to book anything that is too loud. 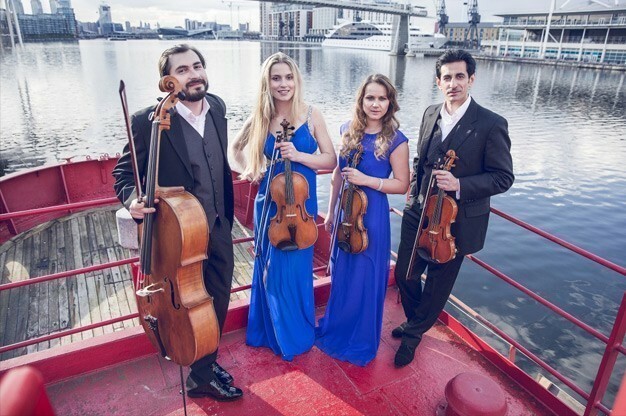 Hiring a String Quartet will give you the perfect sound and make your event very elegant. Usually consisting of two violinists, a cellists and a viola player and combining these instruments gives a simply gorgeous sound. Choose from classical music or modern instrumental tracks as many String Quartets can perform a range of both – always ask to see their repertoire before booking! Want to find a String Quartet for your upcoming award ceremony? Click here to take a look at our listings. 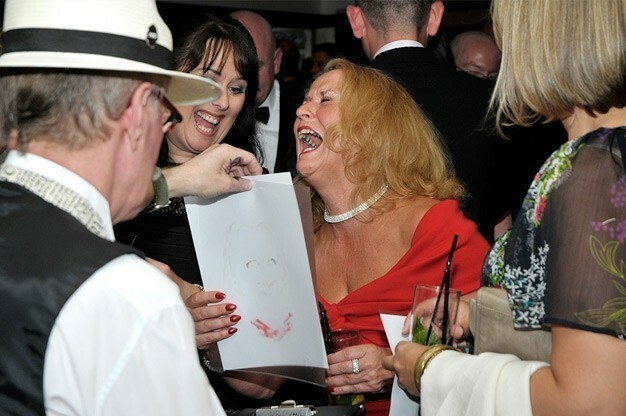 One of the main reasons why we feel that booking a Caricaturist is great for events such as award ceremonies is because they give your guests a little something to take away with them. A Caricaturist will sketch your guests within a few minutes and usually the outcome is rather funny. Emphasising facial features, these drawings make lovely mementos of a fantastic evening. There are many caricaturists available on our website so if you would like to find one, click here to check out who we have on offer! For a stunning visual performance, why not choose an Aerialist or Acrobat? If you are hosting your award ceremony at a particularly regal venue, why not look at booking Aerialists or Acrobats to perform throughout the whole evening! 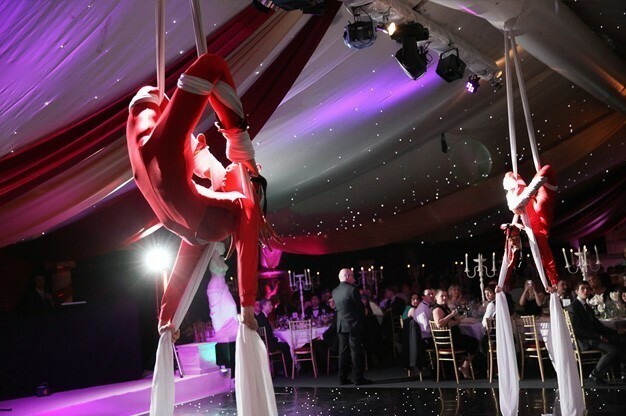 Imagine your guests as they are enjoying the award ceremony with aerialists flying above their heads using all sorts of equipment such as trapezes, hoops and ropes. Acrobats are a better choice if you want to keep the entertainment on the ground, or if your venue is smaller. Click here to find talented Aerialists or Acrobats on our entertainment directory for something that bit different! Still not convinced? 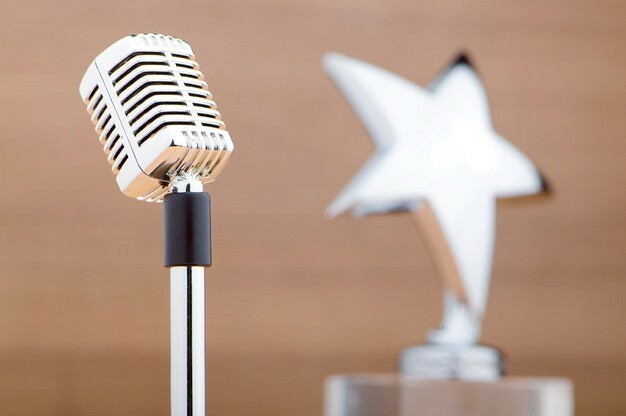 Why not check out the following entertainment ideas for award ceremonies? Book an instrumentalist, such as a cellist for a warm background ambiance. For the ultimate in dramatic entertainment, hire fire performers to perform daring stunts! As you can see we have some amazing entertainment ideas for award ceremonies but don’t forget we have a lot more on offer over on our website, www.EntertainersWorldwide.com – from Comedy Acts, Magic and Illusion Acts and many more Live Bands and Groups, you’ll be sure to find the entertainment you are looking for! We are the biggest entertainment directory on the Internet and we haven’t told you the best bit yet! Our services are absolutely free to use when looking for entertainment! When it comes to booking an entertainer, you can easily contact them directly using the “Request a Quote via E-mail” button which will open up a direct line to them! We do not act as an agency, nor take commission or booking fees so you can be sure to get the best price! We hope you’ll use our website for all of your future entertainment needs! Perfect Entertainment for your Daughter’s Quinceañera!